Canvasback is a species of the diving ducks tribe. It’s the largest and North America’s king of the ducks. Drakes sport rusty red heads, white bodies and black chests and rear-ends. They feed by diving beneath the surface of the water. These gregarious ducks are mainly found on fresh water. Being an avid duck hunter from Texas, I witnessed different species of ducks coming through the Central Fly Zone and longed for the day I would bag a canvasback. Did I mention that the canvasback is the “holy grail” for duck hunters? Mentoring to 3 first-time DIVA duck hunters several seasons back, I decided to book a hunt in northeast Texas, close to the Red River. Shaka Team (named for my trusty compatriot and retrieving dog) arrived primed and pumped for this hunt. The ducks flew fast and furious to the blind to get a closer look at our new hunting gear and shotguns. In retrospect, we could not have chosen a more perfect day for the (canvasback) duck hunt of my lifetime. Shaka never missed a beat during her continuous retrievals, proudly displaying our ducks, dropping them and searching the skies for her next opportunity to splash and fetch. Left-wing DIVAS were an equal match for the right-wing DIVAS. We were poetry in motion. We were one with the gun, sharing a common bond, a symphony of duck hunting, of DIVAS outdoors. “Here comes a pair out front to the left,” whispered our guide, on my side. Bang! One shot and I took the pair! Our guide was so excited he let out a holler that only this Texas cowgirl could understand. I had rodeo-ed a pair of something special. What, you ask? A pair of canvasbacks! As the pair began a helicopter move toward the water, Shaka swam with vigor, retrieving the hen first. Shake got her command to retrieve the drake, and when she arrived – eye to eye with the other facet of the Crown Jewels, he dove. Although this surprised her, at first, her training kicked in and she recalled the many times she had practiced for this day – back there in the “cement pond” in Dallas. The only thing different about this scenario was the drake’s cunning plan to hold onto a piece of grass under the surface of the water. At this point, Shaka became a mermaid, and dove to retrieve the duck. My guide asked me if she knew what she was doing, since she was only 2-years old. Holding my breath, I replied, “I hope so!” Moments later, Shaka sprang up from the water, as her jets had just kicked in, with the drake in her mouth. We all clapped, high-fived and screamed like little school girls for the accomplishments of a young, well-trained hunting dog. 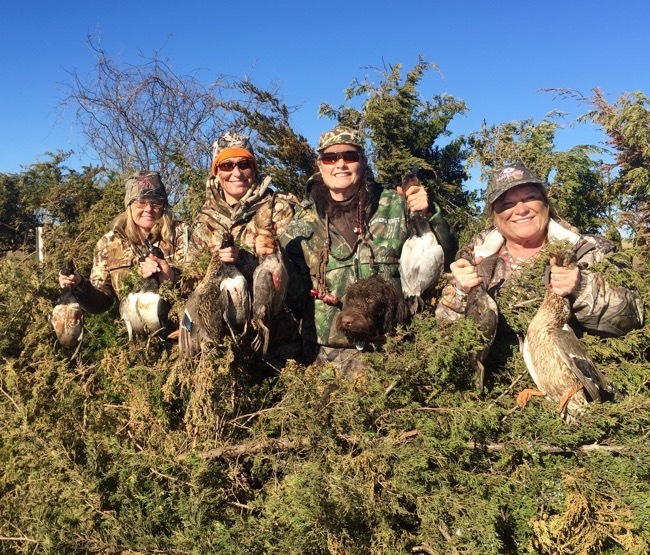 What an exciting moment in my duck hunting life – sharing this story with my DIVA hunting sisters, our guide Andrew and of course, my dear Shaka. And that, my friends, is a story I will take to the (memory) bank. Diving ducks do not walk as well on land as other species of ducks. Their legs are placed farther back on their bodies to help propel them when underwater. TIP: As you may have learned from the aforementioned Shaka retrieval story, canvasbacks can hold on to a piece of grass under the surface for up to 5 minutes. Many times they will drown themselves before they will let go. Keep watching the water where they went under. Canvasbacks are strong fliers, with their strong broad, blunt-tipped wings requiring faster beats than other ducks; they take off with some difficulty. TIP: Lead is very important when shooting a canvasback; in fact, you need 5 times more lead because of the speed when flying. 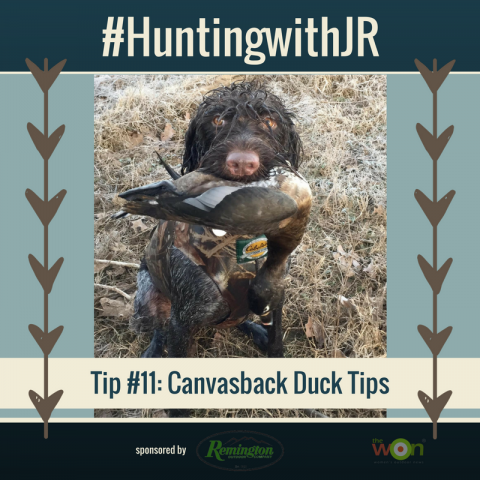 Have you hunting the canvasback?